This 222-page book makes storing and using food storage SIMPLE, with new and easy planning charts. There are over 400 fast and delicious recipes using only stored foods, including over 200 main dishes, double the main dishes in previous editions. You’ll be amazed at what you can make! Updated shelf life information, buying tips, water and fuel information from foremost experts and economical storage ideas help you make informed decisions and find storage space. Learn how to store fuel and to cook in a fuel efficient applebox reflector oven and a haybox. 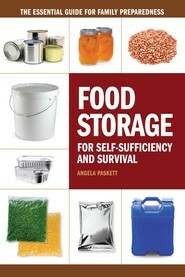 This book makes food storage inexpensive, space efficient and nutritious. 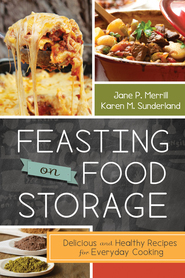 If you have questions about food storage you’ll find simple answers in this best-selling book! Emergency Food Storage In A Nutshell has been a huge help to me. I haven't tried all of the recipes but from this book we have so many family favorites that are even birthday requests. The huge variety of recipes are all from stored food and for me that has the meals being very quick and simple to prepare (I am one who loves to cook from scratch and fresh foods and don't blink at spending 1-1 1/2 hrs preparing a meal). On crazy busy days with my six kids, I will turn to this book and have a meal on the table 30min later (or sooner in many cases), start to finish. I love it!